The new released Duora 8XP (Duo8XP) supports the higher string tension (up to 35 lbs) that hard hitters and players seek for maximum power and precision control. The maximum repulsion achieved from the higher tensions produces powerful drives, especially in offensive play from mid-court. The Duora 8XP features multi-direction carbon fibers that increase the stiffness of the frame, reducing the stress on the frame from the higher than average string tension. With high tension, there will be more vibration. Using the new VibSlayer (Vibration Slayer) Carbon, the material reduces the impact on the arm by dampening vibration instantly. VIBSLAYER CARBON material is utilized throughout the entire frame, combining shock absorption with maintaining maximum power. Manufactured with ultra-thin layers of shock-absorbing material between layers of carbon, players experience the same level of repulsion power generated by normal carbon with greatly reduced shock impact, cutting down on fatigue and stress on the body. 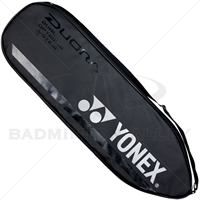 With Yonex new cutting-edge technology, command the court with every single shot using the Duora line of badminton racket. Huge forehands. Quick backhands. The DUORA lets players do both with one revolutionary design. The racket is designed for advanced players seeking fast backhand drive together with smashing power. Created from a material originally developed for the next generation space aviation by Toray Industries, Inc., this marks the first time it has been used within the racket industry. By combining firm shuttle hold and high repulsion, Nanometrid DR puts the DUORA into a class of its own. The DUORA series cutting-edge technology places two unique frame shapes into one revolutionary racquet - combining alternating box and aero-shaped structures on either side of the racquet to command the court with powerful forehands and equally fast backhands. 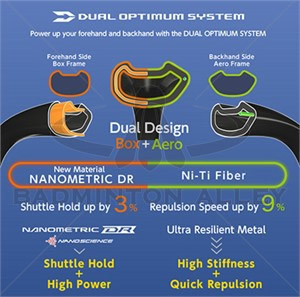 Incorporating the carbon graphite material NANOMETRIC DR, DUORA racquets are afforded firm shuttle hold and high repulsion. *NANOMETRIC material applies the NANOALLOY(TM) Technology of Toray Industries, Inc.
VIBSLAYER CARBON material is utilized throughout the entire frame, combining shock absorption with maximum power. Manufactured with ultra-thin layers of shock-absorbing material between layers of carbon, players experience the same level of repulsion power generated by normal carbon with greatly reduced shock impact, cutting down on fatigue and stress on the body.